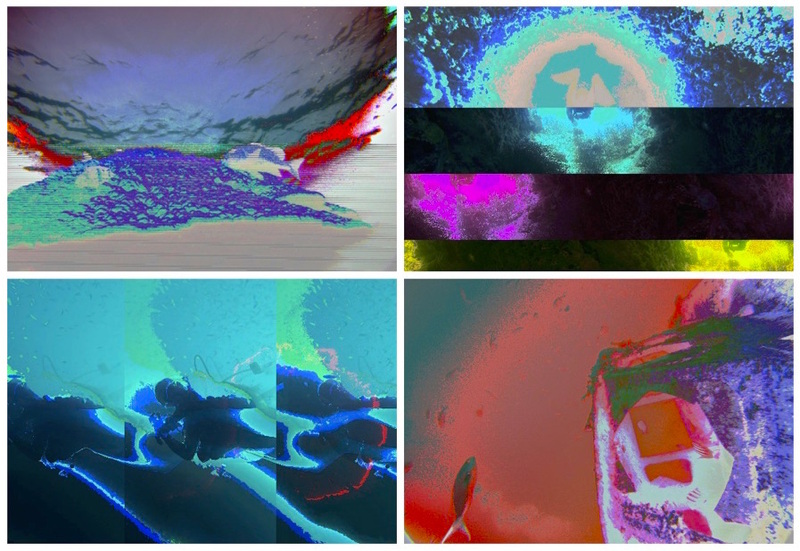 ThalassoGlitch is a selection of glitch images of the sea, mostly underwater photos. It’s a mixture of nature, water and noise interference. The glitch images were created by working with raw images files on audio editor software. Raw data of images or sound can be manipulated in different ways. Here I chose to interfere on the images using the metaphor of the sound, manufacturer resonance interposed on nature. I imported raw image data on Audacity software and worked as if the image were sound. I applied different effects on them such as: echo, repeat, phaser, pitch, invert, speed, profile, noise removal, amplify, reverse, equalizer, leveller, click removal, BassBoost and normalize. Afterwards I exported them as raw data and reopened on image software to re-export as jpg files. The process demanded many steps back and forth between the different software (audio and photo) in order to achieve the desired aesthetics. And also to understand the sound waves as images and how the data is processed. The result is a set of 20 images (glitched photographs) that portray a decaying and adulterated sea, a slide show of corrupted files to be projected. With the theme “Disruption” in mind I created ThalassoGlitch to discuss disruption on the oceans. Climate change, nonpoint source pollution, oil spills, trash, chemical waste and overfishing are causing problems on the sea. Another factor that interfere on seas is noise pollution. The ocean once called “The Silent World” by Jacques Cousteau, nowadays is noisy. The sound waves from ships, sonar devices, oil/gas exploration and mining disturb in the marine life and ecosystem. Some studies show that this noise pollution is especially dangerous to whales and sea lions. This inquietude led me to make ThalassoGlitch, where I used sound editing software to intervene on the waves of underwater photos. The result is a set of images interrupted, disturbed, broken or even damaged by this sound effects manipulation. It’s a mixture of the beauty and the ugly, the nature and the constructed, the romantic and the realist, the flow and the static. Finally, it is my reinvention of the contemporary ocean picture. ThalassoGlitch from Karla Brunet on Vimeo.